You know that a franchise is unstoppable when you need another pair of hands to add up how many films in the series there has been. This instalment marks one digit short of the twentieth entry, and talking of numbers, the third in the Avengers series. You’d also need a few more pairs of hands if you wanted to collate the total of superheroes that appear in this flick, acting as it does as a sort of greatest hits collection of those with a Lycra fetish. Oh and a super power or two. When the doors to the Next store were finally opened, everyone was super excited. When we last caught Thanos (Josh Brolin) (during the end credits for Avengers: Age of Ultron), he was disappointed that his minions failed him, and so decided that he would search for the remaining Infinity Stones himself. And good to his word, that’s what he decides to do. As it wouldn’t necessarily benefit mankind, a group of do-gooders in the superhero shape of the Avengers, decide that it would be best if he didn’t. So they go about getting in his way and getting all up in his super villain grill as much as poss. The save earth roll call sheet includes Doctor Strange (Benedict Cumberbatch), Tony Stark (Robert Downey Jr.), Thor (Chris Hemsworth), Bruce Banner (Mark Ruffalo), Black Panther (Chadwick Boseman) and the latest Avenger, Spider-Man (Tom Holland). 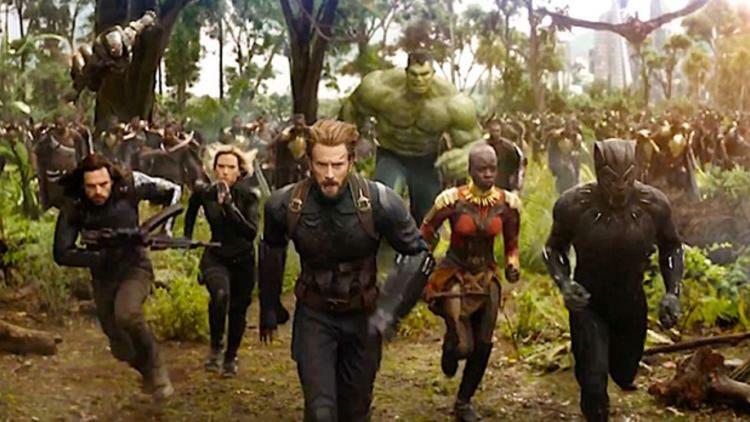 And even though he’s had a massive fallout with Stark, Steve Rogers (Chris Evans) puts their differences aside to help save Earth – God bless Cap’n America – as well as his chums, Black Widow (Scarlett Johansson), War Machine (Don Cheadle) and Falcon (Anthony Mackie). 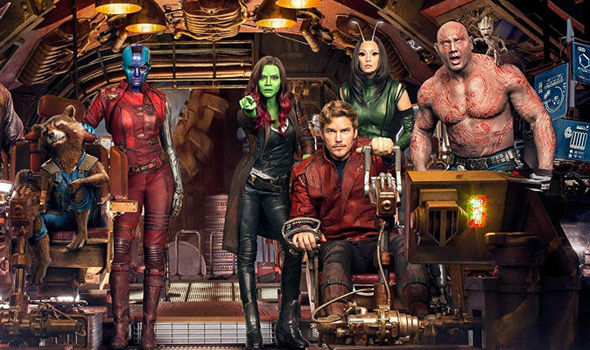 Thor gets himself into a pickle, in space of all places, and ends up being saved by a curious bunch of characters collectively known as the Guardians of the Galaxy, led by Peter Quill (Chris Pratt). They have their own beef with Thanos and are keen to bring him down too. With every superhero under the sun, moon, and all those planets to the left, seemingly on board to stop Thanos completing his Infinity Stones collection, it looks like he’s going to be disappointed. But Thanos is no mug, and is clearly a believer in quality not quantity, so the battle ahead is unlikely to be as straightforward as the Avengers might like it to be. OMG look at the queue for that Next store! Clearly there’s still an appetite for all things Marvel, and what could be more appetising than an XXL helping of all your favourite superheroes. And as this isn’t their first Lycra-clad rodeo, the Russo brothers do a swell job of juggling a multitude of characters. It’s just as well there’s plenty of snappy dialogue as the story itself is pretty thin on the ground. Thanos wants stones, Avengers have to stop Thanos. And that’s very little story to spread out over two and a half hours. What’s worse is that even with all that time, the film still doesn’t have a satisfying conclusion. So after getting punch drunk from what seems like days of CGI slapping you in your face, the story’s circle remains disappointingly incomplete. So if you’re looking for a standalone experience, forget it. As a cross-over experience though, it works really well. It’s not a free-for-all where every character is on screen at the same time; instead each have a group of their own in which their story arc takes place. But with there being an alarmingly heavy ratio of action over plot, less may well have been more. But maybe we’re just grumpy that there wasn’t room for Phil Coulson. What the Russo Brothers do get right though is Brolin as Thanos. He brings almost a level of humanity to the villain of the piece; he’s a thinker, doesn’t fly off the handle and is pretty open to the feelings of others, which are impressive traits in a baddie intent on death and destruction.